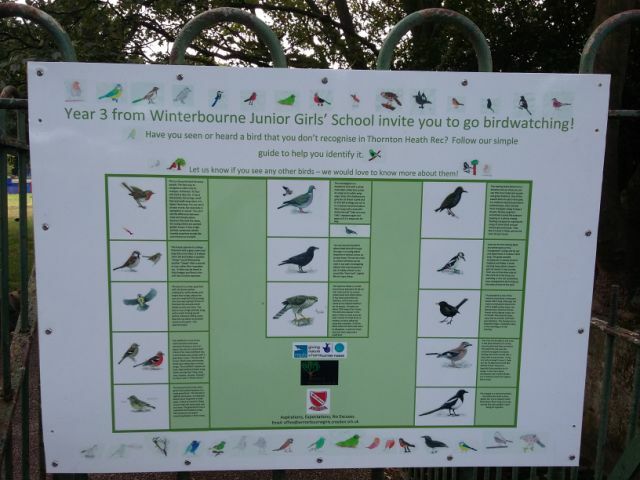 A communities connection with local bird life is set to grow after pupils from Winterbourne Girls school in Croydon produced a bird board to be placed in their local park. Visitors to Thornton Heath Recreation ground in the north of the borough will be encouraged to identify the sights and sounds of the varied bird life in this urban green space. With help from the RSPB and Croydon Voluntary Actions Family Power initiative, the girls have studied a wide range of birds and shared their learning with the wider community. The school hope to develop links further after a talk from RSPB volunteers to the girls which left them with lists of birds that the children can spot when they are at home or out and about and then send back to the local birdwatching group. The school also hope that visitors to the park will respond to the invitation on the bird board to tell the children (via the school website) if they have seen any other kinds of birds in the park.